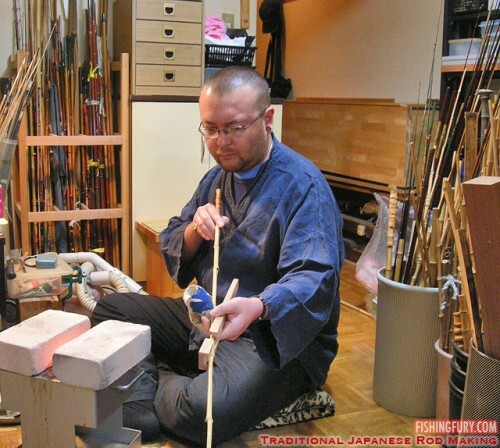 Making A Traditional Japanese Bamboo Fishing Rod | FISHING FURY - A Fishing Blog with Attitude! Since November last year, I have been learning how to make traditional Japanese bamboo fishing rods. My sensei is a local craftsman in my neighbourhood, and is a patient, if stern, teacher. Due to the rapid development of technology by Japanese tackle companies and the great changes in the environment and game fishing in Japan, times are hard for the traditional makers of fishing rods here. However a minority of devoted anglers, including myself, use their creations for their fishing, and for me it ended up a natural progression to try making my own. Another reason I got into the hobby was that I recently had eye surgery and was unable to go out fishing for a long time, and so had to pass the time doing something fishing-related. Here I will describe the process of making my first bamboo fishing rod, with a few photographs. Some of the stages, particularly the lacquering, I was unable to photograph as I had my hands full; also some of the tools and techniques are trade secrets that must remain in the workshop. 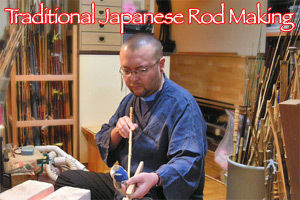 For beginners it is usual to start with a rod for either madai (red snapper) or shirogisu (Japanese whiting) with a bamboo body and fibreglass tip. Since I go fishing for whiting much more often than for snapper, I went for the latter type. The first step is the selection of bamboo; there are many varieties, of which about six or seven are used for rod making. My teacher showed me a variety from his stores, which is bamboo which has been cut and then dried for a number of years. So long as the bamboo is kept free of burrowing insects, it can keep for decades; some of his best bamboo is from his own late master, whose stock dates back to before the War. Unlike bamboo ‘cane’ that is split and fashioned into rods in the West, bamboo is almost always used whole for Japanese fishing rods. 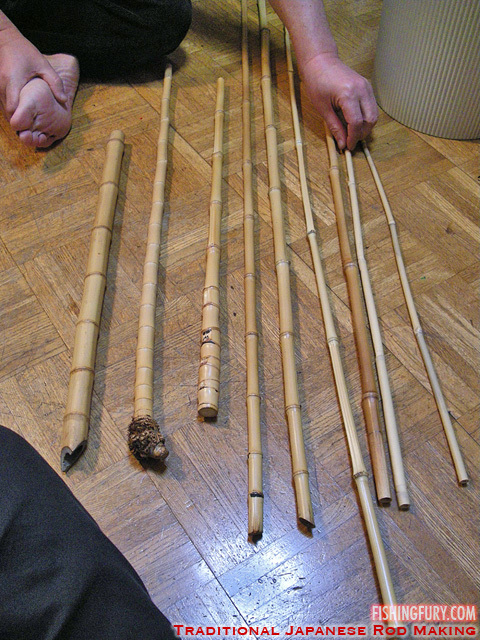 The bamboo is strengthened with a number of special techniques that are used in all sorts of bamboo craft, not just for fishing rods. Of course, for its weight, properly treated bamboo can be as tough as metal – it is still used for scaffolding in building work throughout Asia – and in the semi-tropical climate of Japan it grows almost anywhere, at great speed. Another difference with Western rods and tackle is that almost everything is done by hand; the only electricity used during the entire process was for the vacuum cleaner we used to tidy up afterwards and most of the tools are fairly basic and can be obtained from any DIY store. 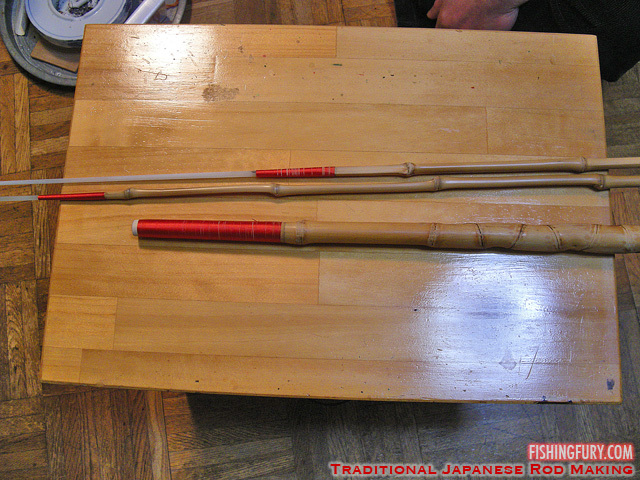 Although my rod was a modern type with a reel seat and a fibreglass tip, more traditional varieties such as for carp or goby fishing are made from completely natural materials; aside from the bamboo itself, the joints are wrapped with silk thread, the wood treatment is made from tree sap, the pegs to wrap the fishing line from fish bone or horse teeth and even the solvent used is oil of camphor. Anyway, once the bamboo is chosen for the rod the pieces are cut into the right size to suit the length, tip and the weight of the rod. Whiting rods are usually two-piece as they are 150 to 180cm in length. 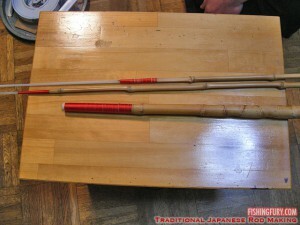 One length of thin bamboo holds the tip to make one piece, and the other piece is a thicker bamboo which will comprise the handle where the reel seat is attached. The first step is to straighten the bamboo. The stalks grow in distinct segments and these are never straight (bamboo always seems to droop in a rather melancholy fashion). This stage is widely regarded as the hardest part of the whole rod-making process, and distinguishes the amateur from the professional at a glance. The lengths of bamboo are heated over a fire and then bent into line using a specially made wooden tool called tame-gi. The firing process not only makes straightening the rod possible, but it also dries out and strengthens it. However, too much heat will burn the wood, and over-zealous bending without sufficient heating will break it. I managed to snap five lengths of bamboo and incinerate one – the practice pieces, not the good stuff – before my teacher stopped laughing and set me aside, and straightened out the bamboo that would be used for my rod whilst I watched and made mental notes. Most traditional crafts in Japan are not codified and there is no text-book; look-and-learn is the method that the teacher passes on his technique to the apprentice. The next step is to wrap the joints of the rod with silk thread. In this case, there is one permanent joint betwixt fibreglass tip and the bamboo holder, and then the joint where that bamboo will fit into the handle. The wrapping is very difficult as the thread is quite fine and there must be no gaps or doubling up of the silk. In the photo, I had to re-wrap the upper and lower pieces as they came out terrible although the one in the middle was, in my teacher’s words, ‘acceptable’ (the upper piece was not for my rod, and I did it as practice). I took this photo to remind myself of the good stuff and the bad.